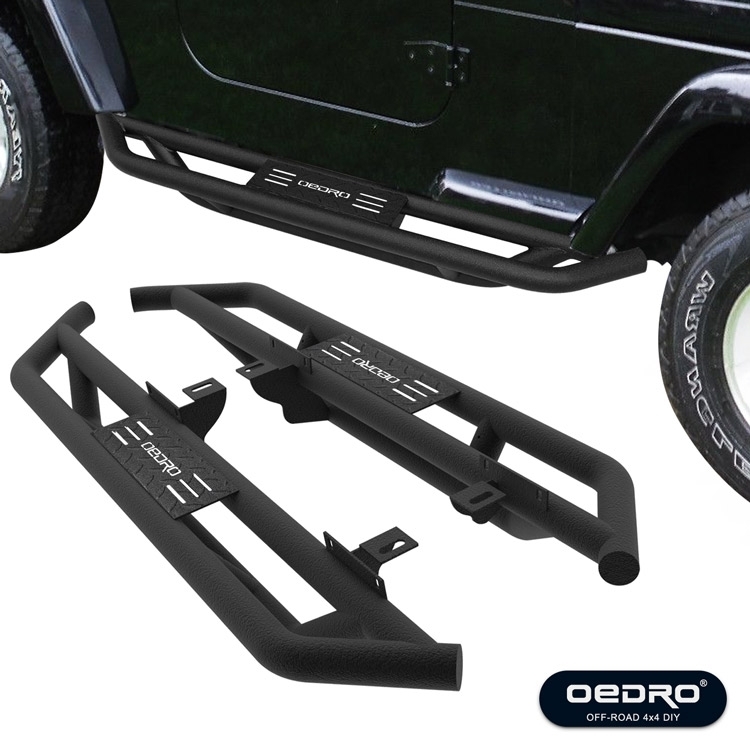 OEDRO Blog - Running Boards Vs. Nerf Bars – What's the Difference? How to Choose? If you find yourself struggling to step into your truck, a running board or nerf bar can add the additional step you need to make your truck more accessible. These popular truck accessories allow you to enter and exit more easily, but sometimes truck owners get confused about what makes them different. Choosing the right option between nerf bars and running boards is not always easy. Here at OEDRO, we want to help make your decision just a little easier. Here’s what you need to know about the differences, so you can make the right choice for your truck. Running boards are not new inventions, either. These flat platforms were first used in horse-drawn carriages, and when automobiles rolled around they were a standard feature, included as part of the chassis. In fact, all cars had running boards until 1936, and trucks came standard with them until the 1950s. 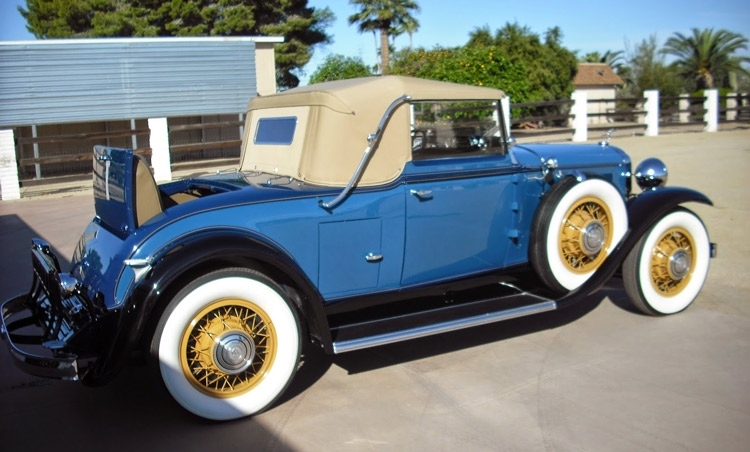 As the focus of vehicle design shifted to improved aerodynamics, cars and trucks started coming without running boards. In the last couple of decades, truck owners have started adding them to their trucks again to make getting in and out of the vehicle easier. Nerf bars got their start, and their name, in the racing industry. These accessories were originally placed on the side of race cars to defend against aggressive racers or to stop passing maneuvers. The name comes from the way the racers would “nerf” or bump each other using this tool. Today, they have evolved into an accessory added to large vehicles, including trucks, to give a place for the driver to step in order to get in and out of the vehicle more easily. If the truck goes off road, nerf bars can protect the rocker panels and doors as well. Nerf bars and running boards perform the same basic function, giving the truck’s driver and passengers a place to step to get into the vehicle. However, they had some distinct differences. Choosing between the two means you need to understand these differences. Running boards tend to be flat, rectangular shapes that are four to seven inches in size, though custom-made boards are available. The size of a nerf bar is measured in diameter, with three-inch diameter and four-inch diameters the most common sizes. Oval-shaped nerf bars can be as wide as six inches in diameter. Length is measured based on where the board or bar falls on the cab. Shape is one of the main differences between these two options. 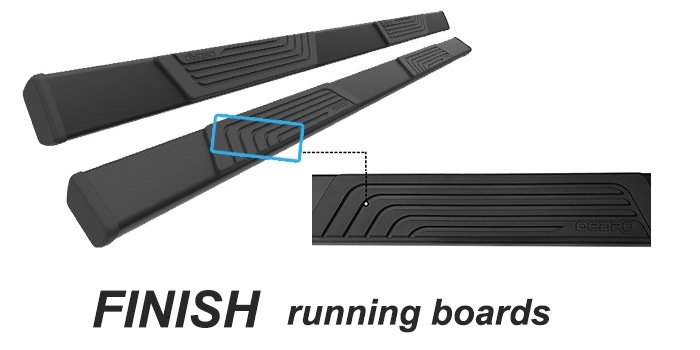 Running boards are rectangular, so they provide a flat surface for stepping. Though the edges may be rounded to give a tubular look to these boards, the top surface is flat, giving a wider surface for grip pads and stepping areas. Nerf bars are rounded on top, with a circular or oval shape when viewed from the end. Like running boards, nerf bars will have grip pads to provide traction when stepping in and out of the vehicle, but they are not as wide due to the smaller surface area of the bar. Both nerf bars and running boards come in a range of finishes, which are similar between the two. Polished steel, polished aluminum and diamond plate all add the shine that you may wish for your truck’s looked. You can also choose from powder coat black, which is durable and understated, or an anodized finish. Painted finish is also available. The finish you choose will depend on the overall look you want for your truck. The material the running board or nerf bar is made from will give it its strength and durability. Choose a material that resists corrosion well and will not rust. Some common options include steel, and stainless steel, aluminum. Stainless steel is preferred over traditional steel because it resists corrosion and rust better than traditional steel, but both types of steel provide durability and strength. Aluminum is a lighter weight material, but it is not quite as rugged as steel. Some lower quality running boards and nerf bars are made from plastic. While this is a more affordable option, it will have a lower weight limit and decreased durability over the long term. 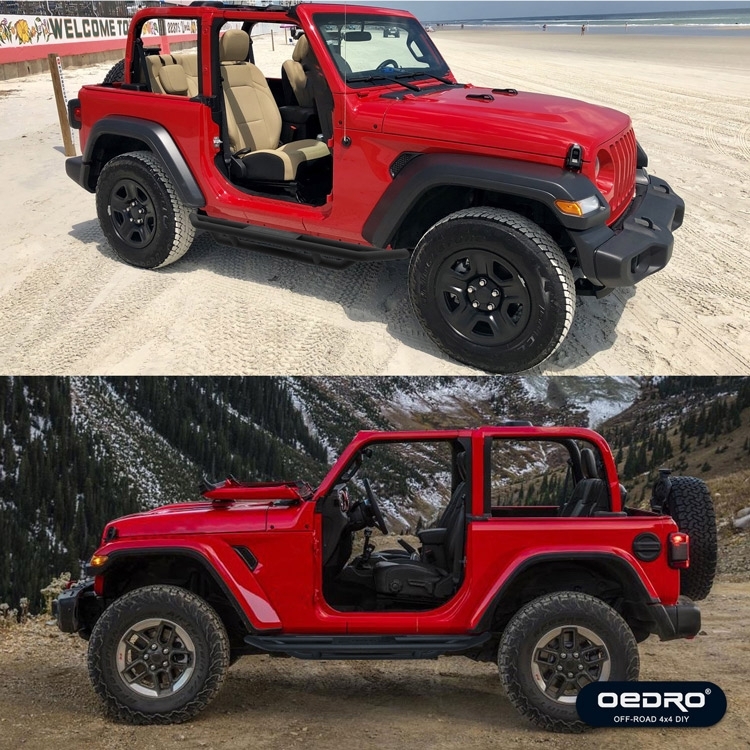 OEDRO running boards are unique in that they are made from three distinct layers, starting with a carbon steel layer, then followed by an electro-galvanized layer, and topped with a final powder coat to give it the desired finish. These are rust-proof and attractive options for your truck. The average nerf bar is designed to hold up to 300 pounds of capacity per tube, with some models holding up to 500 pounds. 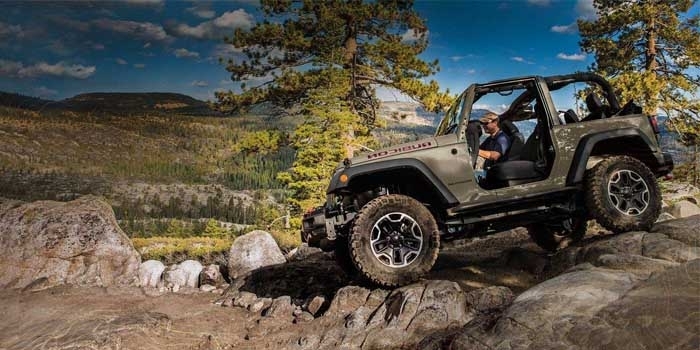 If you need stronger design, you will need reinforced running boards, which are designed to hold up to 600 pounds of weight. 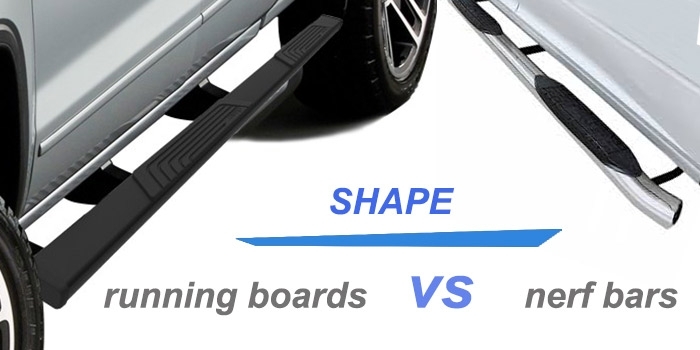 Installation differences between running boards and nerf bars are based on the style and the manufacturer. Most are able to mount to the truck’s existing holes, but sometimes older trucks will require drilling to mount the mounting brackets. The hardware required for mounting will be included with the running board or nerf bar. Running boards make a great choice for getting access to your truck, but they are not perfect. Here is a closer look at the benefits and drawbacks of this choice, which you will want to weigh when making the decisions about which is right for you. If these are the benefits you are looking for, then a running board may be the right choice. Faster seat deterioration when passengers slide out of seats instead of stepping out of the truck. These potential drawbacks are important considerations when deciding whether or not to install running boards on your truck. Like running boards, nerf bars have benefits and drawbacks that need to be considered. While they may be the right choice for some drivers, they are not the right choice for everyone. When you are investing in an accessory for your truck, you want to be certain that it is the right one, so take a look at these pros and cons. For off-roading, nerf bars work as a brush guard, pushing brush away from the truck. If these are benefits you want to enjoy, consider the addition of a nerf bar. If you choose to buy a nerf bar, these are drawbacks you will need to know ahead of time. Nerf Bars Vs. Running Boards – Which Is Right for You? So which is the right choice for your truck? The answer will depend on your desired look and the desired functionality of your accessory. You will need to consider the cost, desired function, size, shape, material, and finish before making your final decision. If you are more concerned about providing yourself and your passengers with a safe stepping platform to access the truck, a running board may be a better fit because of the wider, flatter finish. If you are looking for strength and durability, either design will work well, provided you choose the right material. Ultimately, the choice between nerf bars and running boards may come down to your sense of style. If you want the wider step and increased weight limits of a running board, OEDRO offers strong, attractive models for you to choose from. Shop our inventory today, and find the running boards that will be the perfect addition to your truck.